Gluten-Free Christmas Sugar Blossom Cookies. 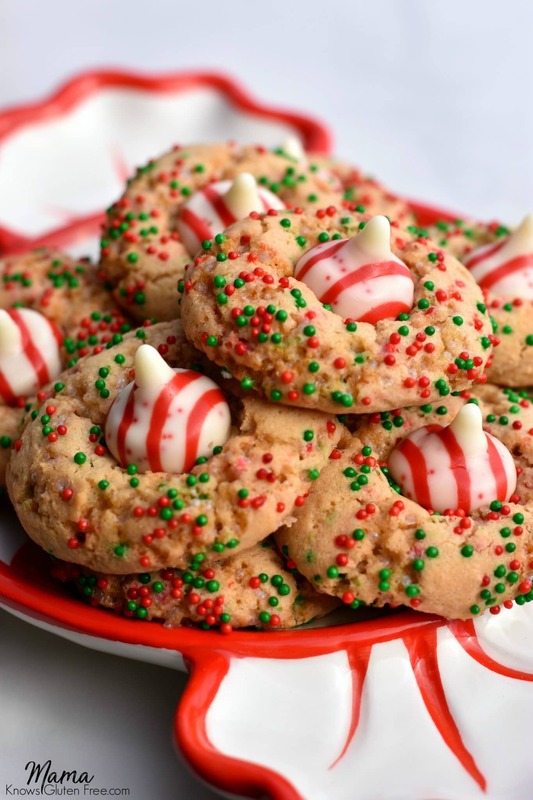 A holiday twist to the traditional blossom cookie. Where gluten-free sugar cookies collide with Hershey Kisses. Baking is one of my love languages. I especially love holiday baking. Baking Christmas cookies brings back so many fond memories of my childhood. My mom always baked a huge assortment of Christmas cookies. She spent a whole day of marathon baking making enough for our family and to share with friends. My mom even took cookies on Christmas Eve to the gate guards on the Air Force Base we lived on. My mom showing love and kindness by sharing Christmas cookies is where I get my love of holiday baking from. I have also included a dairy-free option to the recipe. My husband, myself and youngest son are all dairy-free as well. So now you too can enjoy a gluten-free and dairy-free sugar blossom cookies. I promise it is just as delicious made with the dairy-free butter and milk. Some of my favorite dairy-free alternatives that I like to bake with is almond, cashew or coconut milk. I also like baking with coconut oil or Earth Balance or Smart Balance butter. Hershey Kisses are not dairy-free, so you could use your favorite dairy-free chocolate. My family likes Enjoy Life Foods Mini Chips and Chunks. This tradition of holiday baking is now being passed down to my children. Every year I have a Christmas cookie baking party for my kids and their best friends. They have so much fun decorating their own batch of gluten-free Christmas sugar cookies. Each child gets their own cookie cutters, and I set up a huge decorating station with tons of different colors and shapes of sprinkles. It is so fun for me to see the kid’s faces light up as they creatively decorate each sugar cookie. Each little masterpiece, ready to be brought to life once baked in the oven. Each child’s sugar cookies go separately in the oven, so no one gets their cookies mixed up. Once their cookies have baked and cooled, I place them in a special cookie tin picked out especially for them. This year I decided that I wanted to try something different for my kid’s cookie decorating party. I came up with this version of gluten-free sugar cookies that not only has sprinkles but chocolate also! Because chocolate makes everything better. I’ll still have a huge decorating station, but this year it will also include a variety of flavors of Hershey Kisses too. 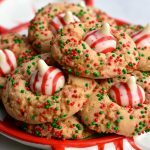 I can’t wait to see how creative the kids get this year with these Gluten-Free Christmas Sugar Blossom Cookies. Try my other Christmas cookie recipes. Happy holiday baking! Get a FREE E-Book of Mama’s Most Popular Recipes! 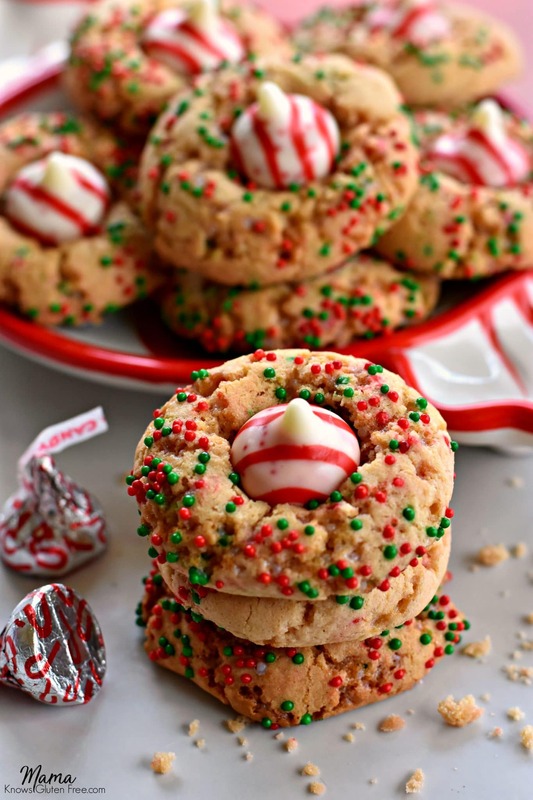 Gluten-Free Christmas Sugar Blossom Cookies. A holiday twist to the traditional blossom cookie. Where sugar cookies collide with Hershey Kisses. 1 tablespoon milk dairy-free use your favorite non-dairy milk. I like cashew, coconut or almond milk. Combine shortening, granulated sugar and brown sugar in large bowl; beat at medium speed until well blended. Add milk. Beat in eggs, one at a time. Add vanilla. Combine flour, baking soda, cream of tartar and salt in a separate large bowl. Mix into shortening mixture until well blended. Roll cookie dough ball in the sprinkles and place onto a parchment-lined baking sheet. As soon as you bring the cookies out of the oven place the Hersey Kisses in the center of each cookie. Allow to cool completely or the Hersey Kisses will flatten. Can I use coconut oil instead of shortening? I have not tried it with coconut oil. I do not think it will give it the moisture or texture the cookies need. If you do not want to use traditional shortening, maybe you could use palm shortening or butter. Thank you for asking! We made these today and they turned out great! My family doesn’t care for sprinkles so I stirred in mini chocolate chips. I also used a variety of Hershey’s Kiss flavors. This recipe is a keeper—thank you for sharing! 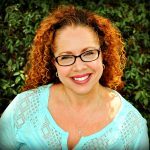 Hi Val thank you so much for the wonderful recipe review! I am so happy to hear that you all enjoyed the cookies. What a great idea to do mini chocolate chips! I will have to try that. You are so welcome I love sharing what I make for my family. Perfect sugar cookie! Made as blossoms and left some plain to frost. The family keeps asking me to make more! Very quick and easy to make too! Thank you so much Helena for the wonderful 5-star recipe review! I am so happy that you and your family enjoyed the sugar blossom cookies. I am also glad that you found them quick and easy to make. I hope you had a wonderful Christmas and Happy New Year!